In one of the earliest posts on this blog I complained about the lack of social-media awareness and interactivity in most B2B webcasts. I haven’t seen much improvement in the intervening 18 months—until today. 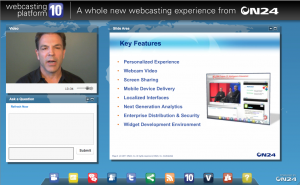 In an online event this morning, webcast service provider On24 showed off a new webcasting platform that provides the kind of multimedia and social-media integration that the technology needs to thrive. If I were still an On24 customer (I last worked with them three years ago) I would be very excited about this new platform. One attraction for me is what appears to be huge flexibility in arranging the console for both the producer and consumer. As an event attendee, I was able to resize, rearrange, and close or open the various windows within my browser, and it appears that the producer has even more flexibility in the setup. There are a number of social media widgets that the producer can add to the console, including Twitter, LinkedIn, and Facebook. One of my complaints about traditional webcasts is the dominance of the slides, which are rarely compelling, to put it politely. The new platform offers a number of ways around that deadly problem. 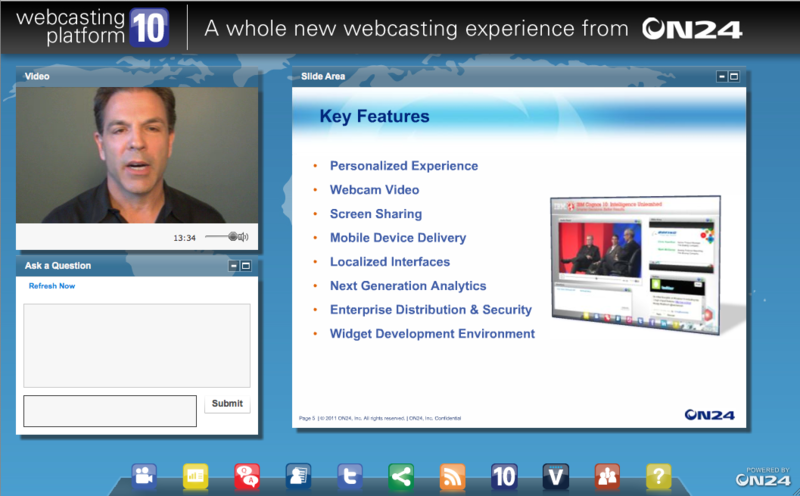 First, it includes live video capability to show the presenter, using a setup as basic as a web cam, and allows for switching between speakers. Perhaps more importantly, it allows presenters to share their screens, so that a degree of spontaneity is possible. There’s a lot more to the new platform than I can address here, and on the basis of a half-hour introduction, I’m probably missing some key points and being overly impressed by others. I’d recommend that you read more for yourself, both on the On24 site and elsewhere. Nothing that On24 does with this platform is revolutionary, but it seems to integrate existing technologies and social-media tools smoothly and effectively. It’s no doubt priced at a level that puts it out of reach for smaller companies, but it may well set a standard for integration and ease of use that will spread to other platforms. Now if only they could supply better waiting-room music. . . . This entry was posted in Webcasting and tagged new media, powerpoint, Social Media, Webinar by John Bethune. Bookmark the permalink.